FAQ: Mega Man and E-Tank - Multiverse Studio Inc.
How do I light up my Mega Man Statue? Plug in the E-tank with the supplied mini-USB cable, and place it next to Mega Man's LEFT leg. 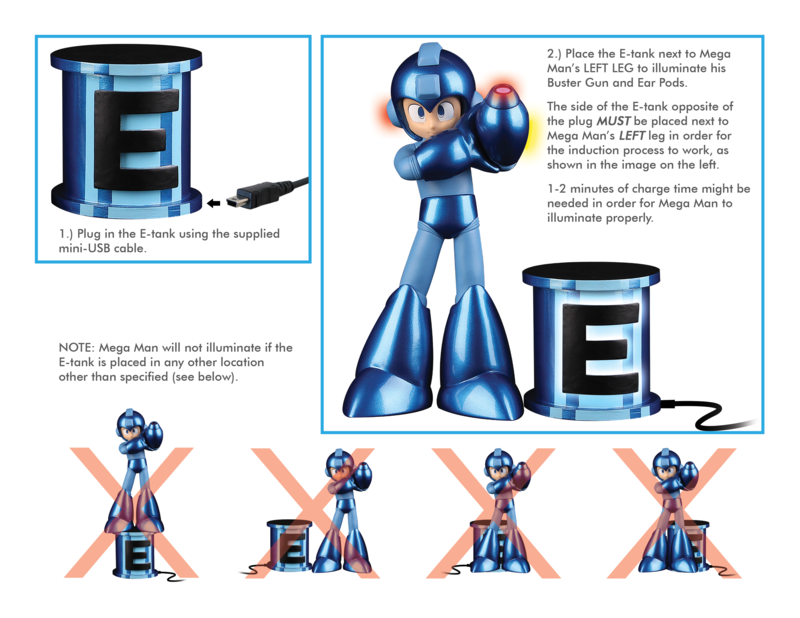 The side of the E-tank opposite of the plug mustbe placed next to Mega Man's left leg for the induction process to work. Why are the lights on my Mega Man statue very dim? First, check to see if the E-tank is positioned correctly (see above). Also, 1 - 2 minutes of charge time are needed in order for Mega Man to illuminate properly. Will Mega Man light up if he is placed in different positions? No. Mega Man will only light up when the E-tank is placed next to his left leg. Where can I purchase the Mega Man & E-tank statue? The Mega Man & E-tank statue is ONLY available at Amazon.com, and is included with the Mega Man Legacy Collection game for PlayStation 4 and Xbox One. Is this figure the same as the Mega Man 25th Anniversary Statue that was released a few years ago? Multiverse Studio produced both the 25th Anniversary Statue and the Mega Man & E-tank statue. While the sculpt is the same, the 25th Anniversary Statue is made out of polystone resin, and included a light-up base. The Mega Man & E-tank statue is made of PVC plastic, and includes a light-up E-tank with induction-charge technology.